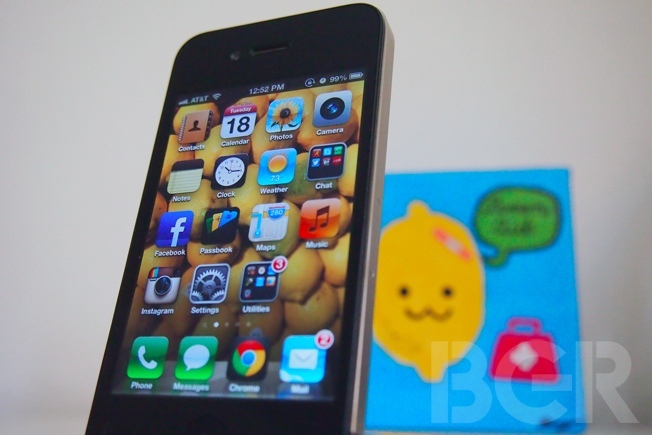 Like OS X Mountain Lion is to Lion, iOS 6 is a refinement of a mobile operating system that Apple (AAPL) had in place in iOS 5, with a few new changes that might raise your brow. Available for iPhone 3GS, iPhone 4, iPhone 4S, iPhone 5, iPad 2, new iPad (third-generation) and iPod touch (fourth-generation), the changes Apple made in iOS 6 are subtle, but add to Apple’s endless pursuit of iOS perfection. It’s an update chock-full of features, as has been the case with every other major iOS update, and best of all: it’s free for all devices. iOS 6 will become available to the public in about an hour so in the meantime, let’s take a look at all of the most important new features Apple’s latest OS has to offer. Let’s start with the major additions. Arguably, there are two new features to be most excited for: the new Apple-built Maps app and Facebook (FB) integration. 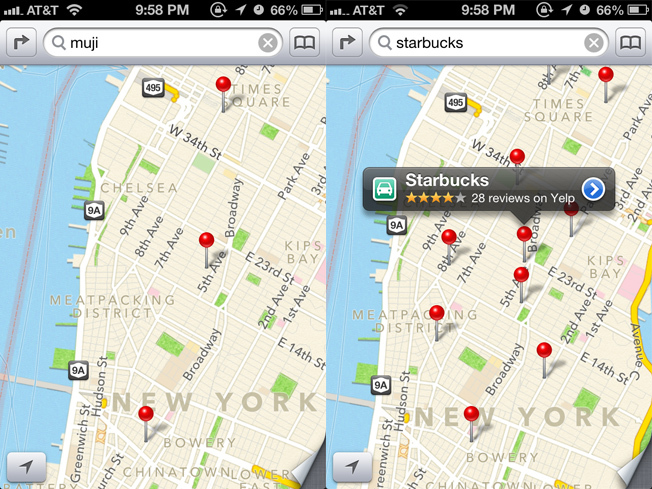 iOS's new Maps app replaces the previous Google Maps app. In iOS 6, Apple officially dumps Google (GOOG) Maps for its own homegrown solution. Right off the bat, you’ll see some similarities between the new Maps app and the old one. At first, it’s hard to tell the difference, but I found the vector-based graphics on the new Maps app were able to render maps much quicker than on the old Google-powered app. Maps is better if you’ve got an iPhone 4S, iPhone 5, new iPad or iPod touch (fourth-gen), as owners of those devices will get both turn-by-turn navigation dictated by Siri and 3D flyover capabilities. Android users will be quick to boast about how they’ve had free turn-by-turn navigation for years, but either way, the playing field is now level. Next up is Facebook integration. In iOS 5, Apple partnered up with Twitter to bake in Tweet buttons across virtually all of iOS’s default apps, and this time Zuckerberg’s team jumped aboard as well. As someone who prefers Facebook over Twitter, being able to update my status from within the Notifications Center or share a photo directly from the Photos app or camera roll to Facebook is terrific. I’m also a big fan of being able to see Facebook events, contact info and birthdays directly plugged into the Calendars and Contacts apps because it saves me from having to manage them myself. If there is any one major feature that sums up iOS 6 for me, it’d be this — it’s not a game changer, but it’s all about making things smoother for the user. From left to right: App Store's new design, unified download/update status page, and how apps look when download is complete. One major change that’s impossible to miss is the redesigned App Store. Using design elements and other tech gained from Apple’s Chomp acquisition, the new App Store is a completely different beast compared to its predecessor. Whereas the old App Store displayed apps in an infinite list, the new App Store uses a card-like system that displays apps horizontally. I don’t mind eye-candy, but when it’s at the sake of function, I’ll pass. To say it’ll take you forever to scroll horizontally through a search of hundreds of apps is not an understatement. I prefer the old vertical list view more. What I do like in the new App Store is that it doesn’t boot you back to the home screen when installing or updating apps and doesn’t constantly nag you to provide a password to download updates to apps or apps that have been previously installed. 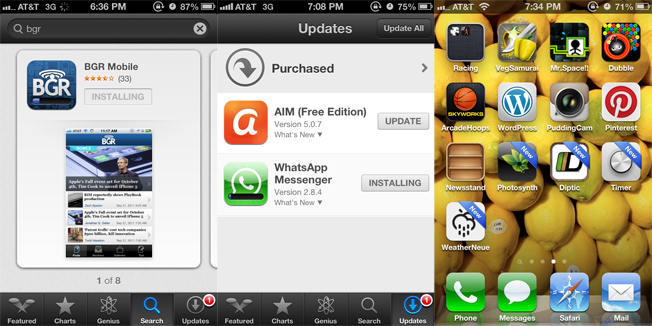 Instead, the new App Store shows you a single unified page with progress bars for app that is installing. Full-screen browsing in landscape mode in Safari. As I mentioned earlier, iOS 6 has a lot of nifty nips and tucks. 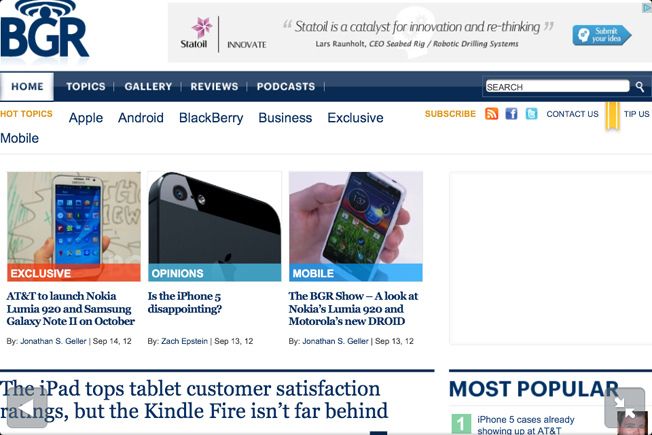 In Safari, there’s a new full-screen browsing mode when iOS devices are held in landscape position. New tabs open up next to current tabs as opposed to next to the last tab, and there’s also iCloud tab syncing and offline reading. While I mostly use the Chrome browser app these days (even if it is a tad bit slower on iOS), Apple’s default browser is what most people will use and it’s now more full-featured and even faster than before. 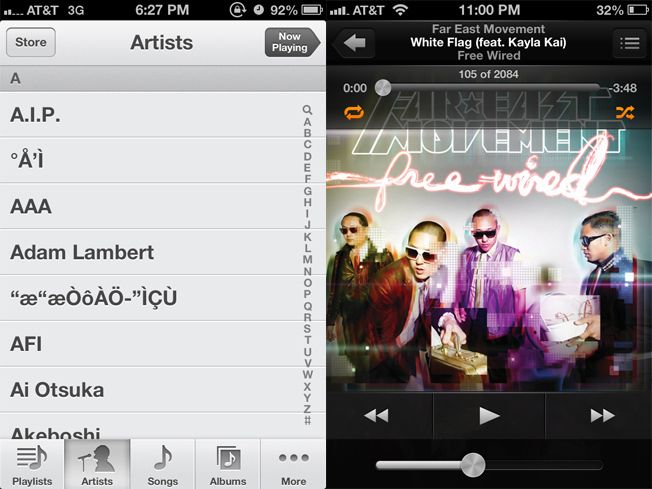 A few subtle redesigns for iOS 6's Music app. Other apps that received some slight tweaks include the Music app (the slider scrubbers have metallic dials that glimmer when the iOS device is turned, the repeat and shuffle buttons are now orange instead of blue, and the song interface buttons match those on the standalone Podcasts app), the phone dialer UI is new, the Camera app’s bar is black instead of silver, and the Mail app supports VIPs and lets you attach photos and videos with a press and hold instead of going through the Photos or Camera app. The ancient Apple-maintained YouTube app has also been removed, but that’s a good thing as the recently released YouTube app is better in every possible way. Many of these small changes are for cosmetic purposes only, but they do make iOS appear fresh again when installed on older hardware. 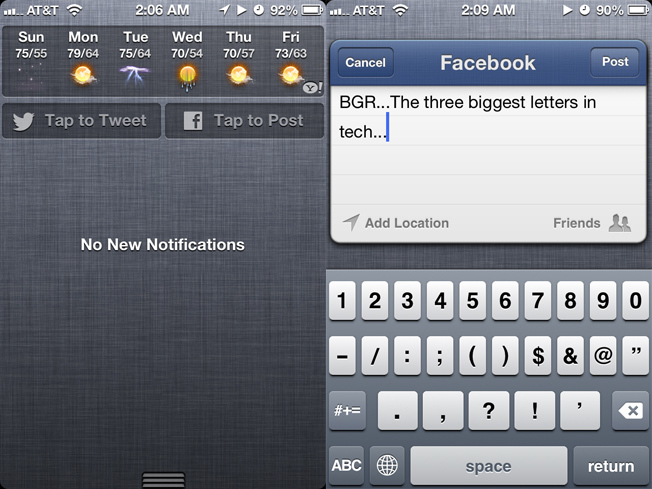 Reply with Message/Remind Me Later (left) and the new sharing menu (right). Of course, there’s more. I can’t vouch for the usefulness of all of these features, but different people will have different needs. Siri is now on the iPad 3 and can do a lot more, including launching apps, looking up movie ratings and reviews, making restaurant reservations and displaying sports stats. There’s Do Not Disturb — a feature that lets you turn off alerts for calls and messages during certain hours (like when you’re sleeping) — and “Reply With Message,” which lets you respond to a call with a text message (default or of your own choosing). These features are useful sometimes, but not revolutionary by any means. FaceTime can also now work over 3G on select carriers for free (Verizon and Sprint, but not AT&T unless you switch to a shared data plan) and if you’ve got an iPhone 4S or iPhone 5, you’ll also get a new panorama shooting mode in the Camera app. In the end, iOS 6 is yet another welcome update to polish off what was already a solid OS. It’s got a ton of small features to make daily inconveniences that much more manageable, and that’s really what technology should be; it should work to make our lives easier. 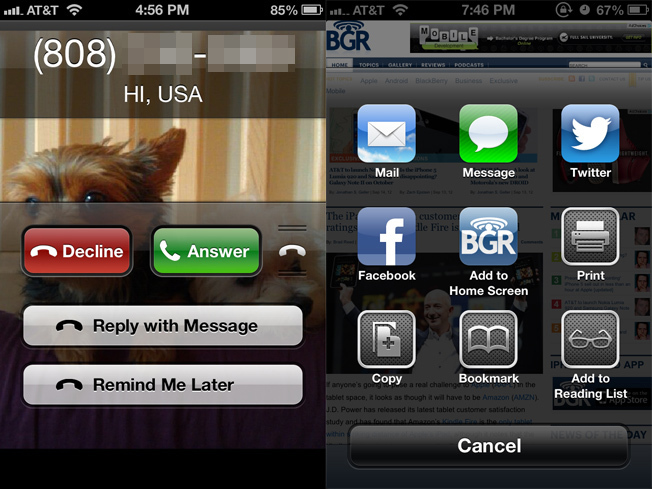 iOS 6 does that in the simplest of ways. It doesn’t break previous conventions for anything bold and new, but who cares? iOS worked beautifully when the original iPhone was released and it’ll work again with the iPhone 5 — with virtually zero “learning” required.